Greg and I were married 29 years ago today. The years have gone by so quickly. It seems like only yesterday we were in Vail, Colorado with our families for that special day. We said our vows in a small chapel in the village. We celebrated at The Lodge. Greg had searched high and low for the perfect song to play for me. He choose Lou Rawls "Forever I Do". I cry every time I hear that song and ...remember. After 29 years, I have a new song for Greg. I love the lyrics to Steven Curtis Chapman's "I Will Be Here". Greg and I have had our ups and downs as most couples will understand (if they're honest). But we've hung in there with each other. I love how far we've come in understanding one another. That really is a life long commitment. I recall the vows we exchanged in that chapel ...'for better, for worse, for richer, for poorer, in sickness and in health, to love and to cherish 'till death do us part'. HAPPY ANNIVERSARY Debbie and Greg! Your right, 29 years is a lifetime of memories and moments and ups and yes downs. Soo glad you have had this man to share your life's moments with! May the Lord bless you with many more! Happy anniversary to you and Greg! Yes, 29 years is a long commitment, and I am glad that I see other couple being in for the long commitment. I totally, we all have our ups and downs, but at the end of the day, we are there for each other, and that counts. Congratulations Greg & Debbie!! What an accomplishment, 29 years. As you look back, so many big & also little things have gone into the shaping of where you are today, and your commitment and love have grown stronger through all of it. I could never find a song that celebrates today more beautifully than the one you have chosen Debbie. Happy 29th... go and eat cake! 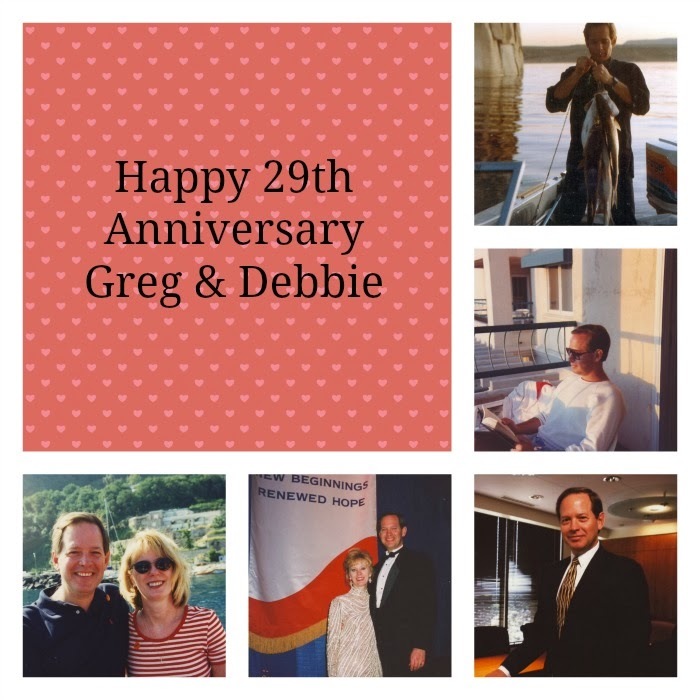 Happy Anniversary, Debbie and Greg! Your words are a beautiful tribute to your marriage and an encouragement for many couples. It is in keeping your commitment to each other and to God that has made you stronger together. Going through the ups and downs and coming out serving and loving each other is a true picture of marriage. Have a wonderful day celebrating! 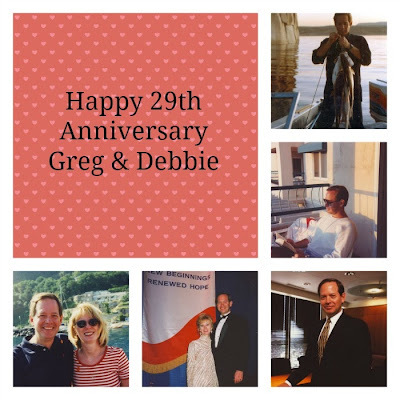 Happy Anniversary Debbie and Greg! You've come a long way; so many blessings on the path of this life together. It seems the longer we are together the better marriage becomes. Sending you big hugs today Debbie. Oh, I do love, "I Will Be Here." Just one of the greatest songs! Congratulations on "hanging in there" for 28 years. You are so right, if couples are honest they wold all agree that it is tough to survive marriage. Tommy and I celebrated 42 years this past July. WOW! that's a long time. Have a great week! Congratulations on 29 years! Praying you had a blessed day. Happy anniversary to you two, dear friend! May the best, most wonderful times of the last 29 years be the worst for the rest of your lives together! Beautiful, Debbie, just beautiful. Many more happy years wished for you both.